Let your imagination free with these fantasy blackwork patterns. The dragon is a Chinese beast, due to having four legs. They are said to be a symbol of good luck, power and strength. Unlike western dragons he is not aggressive but benevolent. 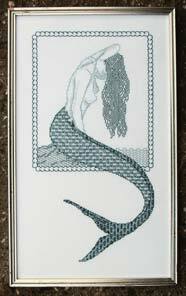 The other mythological creature featured in my fantasy blackwork collection is the mermaid. Some cultures think that mermaids are nasty and connected with shipwrecks and drowning, while others consider them as friendly and tell stories of them falling in love with humans. I like to think of Marina as belonging to the second group. If you haven't tackled blackwork before you might like to download my ebook. Blackwork for Beginners. Simple to stitch, if large, design in red, black and gold. I have also seen this stitched in green and gold and it looked stunning. 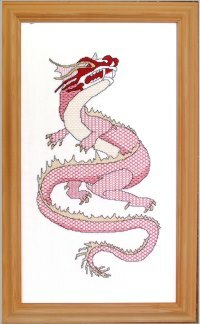 My son was born in the Chinese year of the dragon so this blackwork dragon has special meaning to our family. In this nautical portrait, random dyed thread is used for the mermaid's tail and the sea behind her. The seascape behind her is framed with a border reminiscent of seashells.